A group of college students, up to no good per usual. Journey with them as they lose their way and find their love. In 1994 a group of university students from different provincial areas gather in a boarding house run by baseball coach Sung Dong-il, his wife Lee Ii-hwa and their daughter Na-jung. The story follows the students as they explore career options, academic pursuits, romance and what it means to be friends. They bond over their shared confusion in the new city, grow from complete repulsion to being inseparable. They laugh and love together as much as they cry and hurt together; it is 1994, they are all just beginning their journey. I hate this show with a passion, not because it had bad actors or a terrible script, but because it stabbed me in the heart and I still cannot even bear to watch a few scenes in the last episode. The director capitalized on the success of Reply 1997 by turning up the mystery of the age old “who is the husband” question. Viewers like myself fell victim to the pitting war and cheered vehemently for the character we thought would get the girl. Unlike traditional dramas where we are so sure who is the charmer that is destined to lose the girl, in Reply 1994 we did not know until pretty much the last episode. There were clues, sure, but every time you thought you got it, the show threw you a curve ball (no pun intended) and you are forced to crawl back into fetal position, nervously biting your nails as you continue to pray your favorite will get picked. The series is well written — I found myself rolling in bed after an episode wishing the director would just tell us who the husband is so I can sleep at night. In that way, the show was both incredibly successful in being on your mind and equally so in wasting away your patience. I loved the subplots almost a bit more, and the secondary characters were so lovable that I can confidently say if they did not exist this show would have bombed big time. If you like Reply 1997, then you will enjoy this slice of pie, but be forewarned that you might be disappointed. Even though it retained much of the same humor and sweetness, Reply 1994 is a completely different in every sense of the word. I wish instead of trying to drag the viewers along for the ride through the mystery husband story line, the director would have made other efforts to keep us. While I certainly do not regret watching it, I don’t think I could ever go back and relive it, but perhaps that’s because the hurt is too deep and I’m just not ready to call yet (you will understand this line if you get to the last episode). Go Ara recently starred in You’re All Surrounded, which airs on Wednesdays and Thursdays. Baro is the main rapper of boy band B1A4. Min Do-hee is the main rapper of girl band Tiny-G. Sung Dong-il and Lee Il-hwa pretty much played the same characters as in Reply 1997, which caused a lot of laughter! 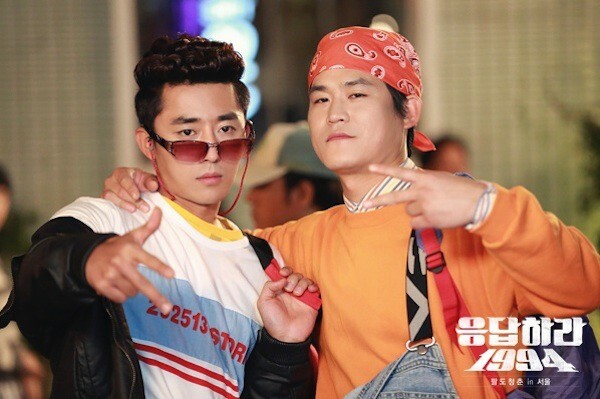 Cameo appearances from Jung Eung-ji and Seo In-guk of Reply 1997 were in abundance. Sung Dong-il is currently in It’s Okay, That’s Love.